Yeah, that photo up there is exactly what it looks like. That's a ten year-old boy, Issa, working in a weapons factory, making mortar shells and fixing launchers, for the rebels in the Free Syrian Army. Issa works 70 hours a week. The photos seem to show him working alone most of the time. 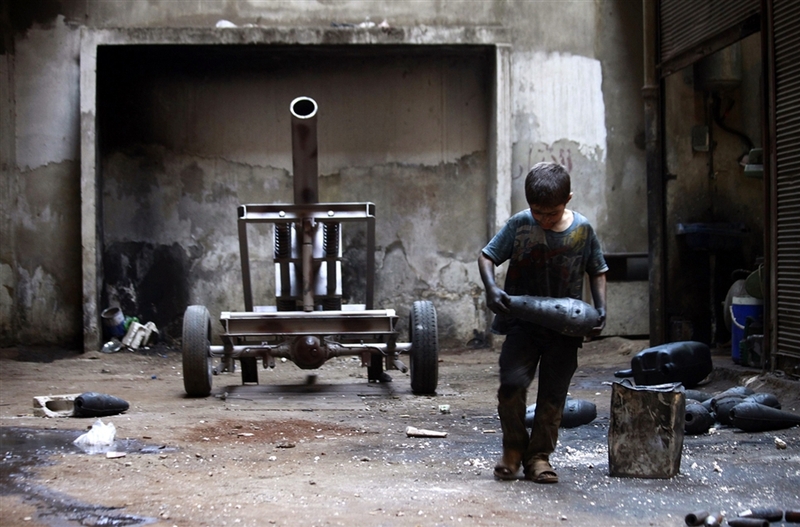 Syria's official army allegedly murders kids, sometimes with chemicals. The rebels use kids for soldiers and building their arms. Remember when we were all so upset about Uganda's Joseph Kony last year? Remember when that was a cause of the month most everyone forgot about? One of the things we were pissed about was his use of child soldiers. Of course, you could say the kids in Syria want to help in the fight against Bashar al Assad, but that's a mighty fine red line you're walking. The point here is that who has done what in Syria is way more complicated than the bombing advocates are letting on. No, there's no case to support Assad, a bureaucratic, emotionless war criminal who lacks lips and sports a moustache that only Hitler could love. But, as the Rude Pundit has said before in too many cases, if you're picking the lesser of two evils, you're still picking evil.